In February 2005, the future Mr. ToughCookieNYC and I graduated from circling each other in a shy, awkward mating dance (choreographed for nerds, by nerds) and took our first tentative steps as a couple. Seven years later, I’d say we’ve hit the tango stage of our relationship– both figuratively and literally. 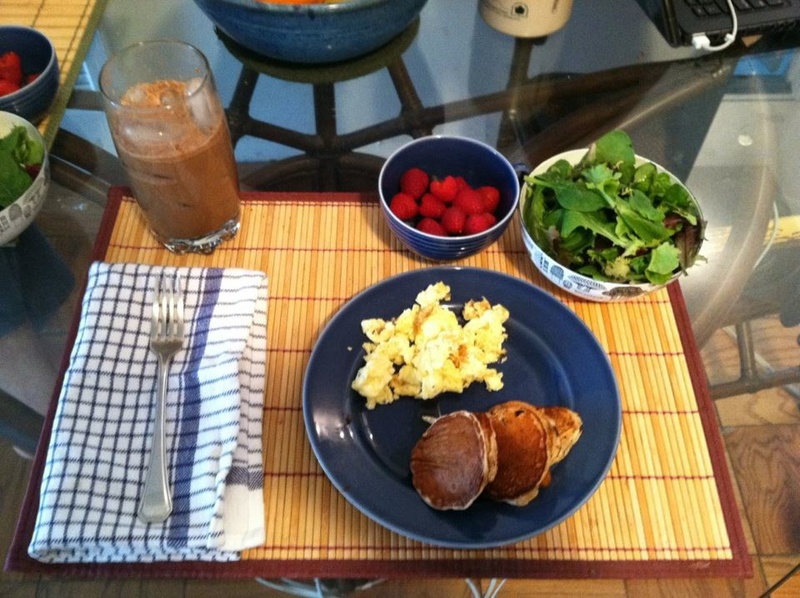 What better way to celebrate our love than a brunch that’s both health-conscious and flavorful? I think the brunch was a success, as my Husband Elect started attacking his food before I could snap a picture of the plate. So you don’t get to see the perfectly crispy turkey bacon I made. Also not pictured: fresh-squeezed orange juice. I may or may not have squeezed the oranges with my bare hands, as I imagine She-Hulk might. I tried to come up with traditional brunch classics (scrambled eggs, pancakes, bacon, juice, coffee) and reinvent them in a way that felt indulgent without actually being unhealthy. The pancakes were light and fluffy, but I used egg whites, skim milk, and applesauce, instead of whole milk and butter. The scrambled eggs had 2 whole eggs and a generous helping of egg whites. My iced mocha? Made with skim milk, cocoa powder, and a scoop of unsweetened protein powder. And the salad and mixed berries provide fiber and vitamins. Crack the eggs into a bowl; beat with a fork to blend yolks and whites. Add egg whites and skim milk, and beat with fork until blended. Add salt and pepper. Place a skillet over medium heat; melt a little butter (or use cooking spray, if preferred) into the pan. Pour in the eggs. As the eggs begin to set, gently pull the mixture across the pan with the fork, forming large curds (or clumps). Work from all angles of the pan, gently moving the eggs around as they cook. No need to stir constantly– just pull and rest, pull and rest. When eggs are cooked to desired consistency, serve immediately, grating a little extra fresh pepper over the top to taste. Combine flour and baking soda in a large bowl; mix with fork. In a separate bowl, mix the wet ingredients. Add the wet ingredients to the dry ingredients, folding batter with a spoon. Be careful not to overmix. In a large pan, melt a little butter (or cooking spray) over medium heat. Pour batter in spoonfuls, leaving room between pancakes. When small bubbles start to appear, add chocolate chips, berries, etc. to batter. When bubbles cover most of the pancake’s top surface, flip with non-stick spatula and let cook an extra 1-2 minutes on the other side. Serve immediately, with fruit compote or pure maple syrup. I’ve been using canola oil instead of butter in my pancakes, which I’ve zapped up with sweet potatoes. Next time I’ll try apple sauce, as I DID know it can replace butter in recipes due to its pectin content but had forgotten. I love posts about healthy eating – thanks! Sweet potatoes are a great idea! I’ve made butternut squash and pumpkin breads, but I’ll have to try making sweet potato pancakes. Glad you liked the post!